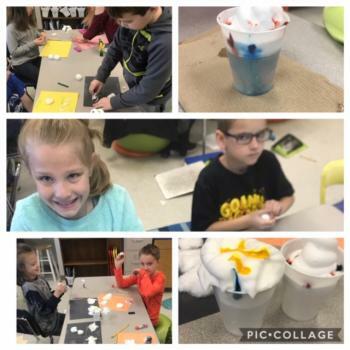 Students in Mrs. Cone’s 3rd grade Science class have been learnin about the various types of clouds and how condensation forms in clouds to produce rain. Today they experimented with various materials to make models of the different types of clouds including cirrus, cummulus, stratus, and cumulonimbus clous. Students then conducted an experiment to learn how condensation forms in clouds to produce rain. Students took clear plastic cups and water in the bottom and put shaving cream on the top to represent clouds. They then added dops of food coloring to the shaving cream which represents water forming in clouds. As the food color became more dense, it dropped through the shaving cream into the water which simulates how rain forms and falls in the atmosphere.